United Airlines flight 4933 at the Presque Isle International Airport Monday afternoon, after landing off the runway around 11:30 a.m. The incident shutdown the airport until an investigation by the Federal Aviation Administration. 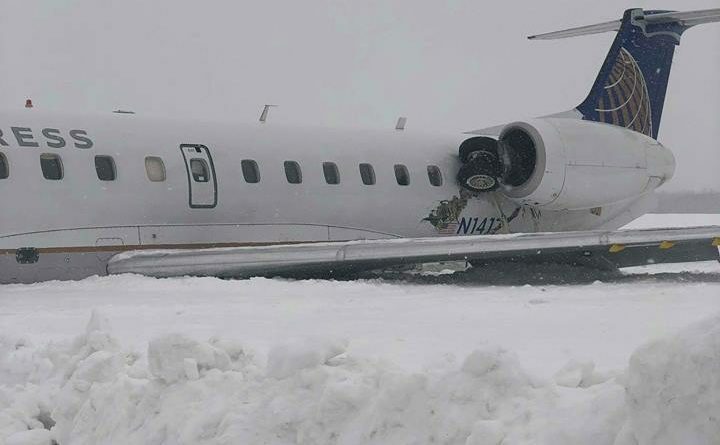 Rick and Cassie Daigle, owners of Too Far North Fitness in Fort Kent, were on this United flight that ended up off the runway at the airport in Presque Isle on Monday morning. Cassie Daigle took this photo after she and her husband were off the plane. It appears that part of the landing gear is embedded in one of the engines. 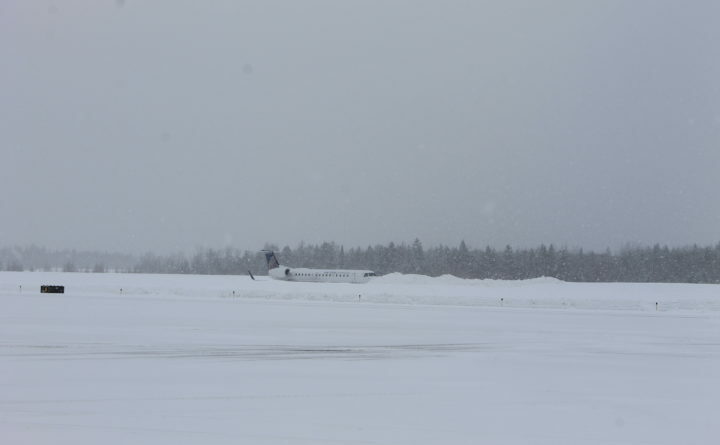 PRESQUE ISLE, Maine — A United Airlines flight from Newark to Presque Isle landed roughly on its second approach and then slid off the runway Monday as passengers screamed and some seat parts popped off, according to one occupant. Of the 28 passengers and four crew members on board, four passengers and the pilot were taken to the hospital with minor injuries, according to Kim Smith, Presque Isle public information officer. Presque Isle International Airport will be closed until further notice as representatives of the Federal Aviation Administration investigate, Smith said. The United flights for the Newark-Presque Isle service are operated by CommuteAir, which is partly owned by United. The service runs two outbound and inbound flights per day on weekdays, and one outbound and one inbound flight per day on weekends. The aircraft that arrived around 11:30 a.m. Monday also received unspecified damage and is remaining in place until investigators with the Federal Aviation Administration can assess the incident, Smith said. It is not clear what may have caused this to happen, Smith said. The accident closed the airport Monday, and it is not known immediately when outgoing and incoming flights will resume, she said. Rick and Cassie Daigle, owners of Too Far North Fitness in Fort Kent, were on the flight returning from Columbus, Ohio, where Cassie Daigle was competing in a kettlebell event at the Arnold Sports Expo. Rick Daigle said from the airport via an interview using Facebook messenger that passengers realized there was a problem even before the plane hit the runway. Daigle said the plane then bounced four or five times before coming to a stop at a location far from the runway. The scene inside the airplane as it landed was one of chaos with people screaming and seats coming apart, Daigle said. Daigle said his wife hit her head during the incident and once the couple returns to Fort Kent she plans to be evaluated at Northern Maine Medical Center as a precaution. “We climbed out on a ladder with the help of local firefighters,” he said. The Daigles were still at the airport as of 2 p.m. after having been interviewed by emergency medical technicians and a United representative, Daigle said. The Daigles are parents to a 4 ½-year-old son. “Cass did say to me she will be OK when she sees Keegan,” Rick Daigle said. “I do want answers though,” he said.